Happy New Year to everyone, let's hope it's a good one as they say. We have an excellent programme of events for the first 6 months of the year which I'll outline below. All members of the Friends will be receiving a flyer with all the information you see here with their Journal later on in January. In the meantime, hard copies of the flyer can be obtained from the museum. 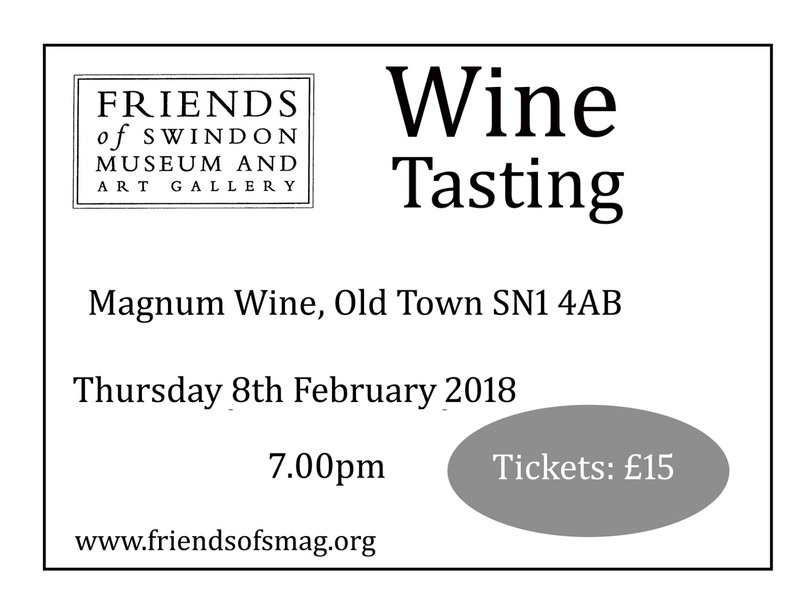 We're kicking off the new year with a wine tasting at Magnum Wines in Wood Street on Thursday 8 February starting at 7pm. Brian Saunders will be introducing us to some excellent wines, and sharing his extensive background knowledge of all of them. There will be cheese and nibbles in between wines. Brian is seen above posing with a bottle of wine for promotional purposes. 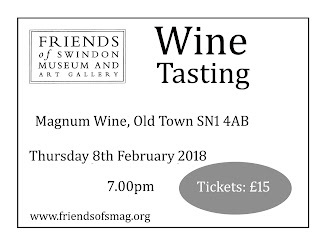 The tickets, seen below are £15 and are obtainable from Magnum Wine in Wood St, or the museum. Please encourage your friends to come along, the evening is an opportunity to meet up in a social situation and raise funds for the museum. On 29 March, Sophie Cummings will be talking about German modern art, and on 9 April, we have a coach trip to London. Our May talk on 31 May is by Richard Henry on 50 Finds from Wiltshire, and we have a trip to a Sculpture Exhibition at Urchfont Manor on Friday 22 June. That leaves our talk on Thursday 28 June by Kate Malone, we have yet to book a venue to hold the talk, we though there might be more than 53 people wanting to hear Kate talk, so we will hire somewhere else. Swindon Dance, in the former Town Hall has proved an excellent choice when we want a larger venue, but they are occupied on that date.